We called out yesterday the S&P 500 SPY ETF (NYSEARCA:SPY) having a key level of 265. Breaking above it is bullish and can follow through. "Whatever happens we need the market to guide us. We think the two key levels are 265 and 261 for the S&P 500 ETF SPY. Closing above 265 and we'd expect the market can continue to have follow through to the upside. Not doing it and it's worth being patient." A little after 12 EDT yesterday on chat we recommended to start buying ahead of the Fed when we saw the market was already comfortably above 265. We felt it could hold higher by the close. And we're seeing the follow through today. I think this follow-through today can last a week or two potentially. 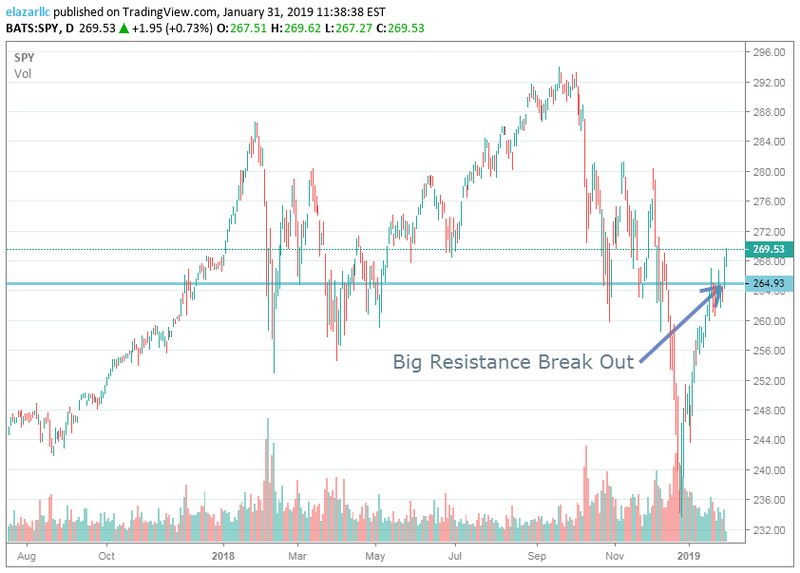 The market could also get excited about the coming trade war resolution meeting coming towards month's end. Want more? Click here for a 14 day free trial. We also have a ton of new Tech Buys. Join Us. "great work Chaim! rock star ur a rock star!